In the last few years, there has been a rise of these very self-aware genre movies beginning with the Quentin Tarantino/Robert Rodriguez GRINDHOUSE. As with everything, they come in varying qualities from the worst (SHARKNADO or basically anything from Syfy) to the legit good (Astron 6's MANBORG and Jason Eisener's HOBO WITH A SHOTGUN). 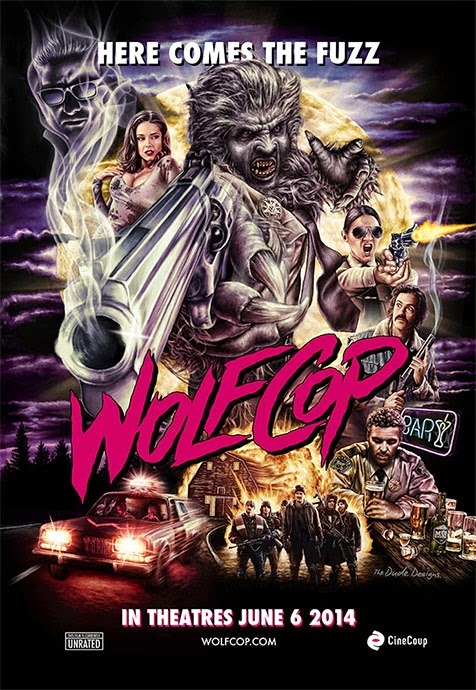 Thankfully, WOLFCOP is on the good end of the spectrum. By taking a story that we all know and adding in new and interesting elements to the werewolf mythos, we get a film that's a raunchy fun good time. WOLFCOP stars Leo Fafard as Lou Garou, a police office in a small town who is a functioning (?) alcoholic just going through the motions. For some very strange reason, there is a yearly drunken shoot out which occurs in the woods that is unexpectedly cancelled once people start disappearing and eventually turning up dead. Not that this would spoil the movie, but through a chain of events, Lou is turned into the titular Wolfcop. One of the things that ALWAYS comes up in werewolf movies is the transformation. Ever since special effects guru Rick Baker set the standard in AN AMERICAN WEREWOLF IN LONDON, the transformation is crucial and it can make or break people's perception of the movie. Without spoiling much, this is probably one of the dirtiest and bloodiest transformation sequences in recent memory. The werewolf effects are top-notch and the movie thankfully doesn't go for cheap effects and cartoonish amount of blood. It actually hits the sweet spot between campy and serious violence which is welcome in these type of genre movies. As far as the story goes, it's a good mix of different story elements that any horror fan will be aware, between sinister cults, conspiracies, and an ancient curse are all here. These elements are all present in a way that feels refreshing even if it's not re-inventing the wheel. What was most enjoyable is how it added to the "rules" of being a werewolf, and what that entails in an interesting manner that hopefully will be picked up in other movies. In addition, all of the actors in the movie do a fine job in their respective roles and there's no real need for super flashy acting in this type of movie. WOLFCOP is a fun movie, full of great special effects, some dark humor, and good old-fashioned gore. Check this movie out as soon as it's available and you won't regret it.